The 2013 UEFA Champions League Final was the final match of the 2012–13 UEFA Champions League, the 58th season of Europe's premier club football tournament organised by UEFA, and the 21st season since it was renamed from the European Champion Clubs' Cup to the UEFA Champions League. The match took place on Saturday, 25 May 2013, at Wembley Stadium in London, England, between German Bundesliga clubs Borussia Dortmund and Bayern Munich. In the first all-German Champions League final, Bayern won the match 2–1 with goals from Mario Mandžukić and man of the match Arjen Robben coming either side of an İlkay Gündoğan penalty for Dortmund. One week later, Bayern won the 2013 DFB-Pokal and, having already won the 2013 Bundesliga, completed the Continental Treble. As a result of their Champions League win, Bayern qualified to play against Chelsea, the winners of the 2012–13 UEFA Europa League, in the 2013 UEFA Super Cup, and also earned the right to enter the semi-finals of the 2013 FIFA Club World Cup as the UEFA representative. They would eventually go on to win both competitions. Wembley Stadium has hosted the European Cup final seven times, including 2011 and 2013. Wembley Stadium, England's national stadium and home of the England national football team, was announced as the venue of the 2013 final on 16 June 2011. Having hosted the 2011 final, Wembley made history for being the first stadium in the tournament's history to host the final twice in three years. Discussing the short time between the two finals, UEFA President Michel Platini explained that the final would be in celebration of 150 years of the Football Association's existence. It was the seventh occasion that Wembley hosted the final after hosting the 1963, 1968, 1971, 1978, 1992 and the 2011 finals of Europe's premier club competition. The original Wembley Stadium hosted five European Cup finals. The 1968 and 1978 finals were both won by English sides: Manchester United beat Benfica 4–1 in 1968 and Liverpool defeated Club Brugge 1–0 in 1978. Benfica also lost in the 1963 final, beaten 2–1 by Milan, while Ajax won the first of three consecutive European Cups at Wembley in 1971, beating Panathinaikos 2–0. In the 1992 final, Spanish club Barcelona defeated Italian side Sampdoria 1–0 in the final match played as the European Cup prior to the following season's introduction of the current Champions League format. First opened for the British Empire Exhibition in 1923, the stadium was originally known as the Empire Stadium. That year, it hosted its first FA Cup Final, when almost 200,000 spectators attempted to watch the match between Bolton Wanderers and West Ham United. Wembley played host to all of England's matches at the 1966 FIFA World Cup, including the 4–2 victory over West Germany in the final, and at UEFA Euro 1996. The original stadium was closed in 2000 and demolished three years later, to be replaced by a 90,000-capacity arena, which opened in 2007. The new stadium hosted the 2011 UEFA Champions League Final, which pitted Barcelona against Manchester United in a re-match of the final played two years previously. Barcelona claimed their fourth European title as they ran out 3–1 winners. This was the first time in the history of the Champions League (and European Cup) that the final was contested between two German sides. There were three previous Champions League finals between two clubs from the same country: 2000 (Spain), 2003 (Italy), and 2008 (England). It was Bayern Munich's 10th European Cup/Champions League final, third all-time behind Real Madrid (12) and Milan (11). They won four of those finals: in 1974, 1975, 1976, and most recently in 2001. The 2013 final was Bayern's third final in four years; they lost in both 2010 and 2012 (as the first team since 1984 to reach the Final held in their home stadium), adding to previous final losses in 1982, 1987, and 1999. For Dortmund, this was their second Champions League final, with them winning their first title in 1997. The next season as defending champions, they defeated Bayern in their only previous meetings in European competitions, winning 1–0 on aggregate in the 1997–98 UEFA Champions League quarter-finals, before being eliminated 2–0 on aggregate in the semi-finals by Real Madrid, managed by Jupp Heynckes, who took over as Bayern coach in 2011. In 2003, Bayern provided a €2 million loan without collateral to the nearly bankrupt Dortmund which has since been repaid. There has been a heated rivalry between Bayern and Dortmund, known in Germany as Der Klassiker, which became prevalent during the 1990s. In 2011–12, Dortmund won the Bundesliga and the DFB Pokal with Bayern finishing runners-up in both competitions. In 2012–13, Bayern bested Dortmund for both trophies, as well as the DFL-Supercup. Just before Dortmund's Champions League semi-final, it was announced that one of their homegrown stars, Mario Götze, would make a €37 million transfer to Bayern for the upcoming 2013–14 season, a move that some felt would have put more distance between wealthy Bayern and the rest of the Bundesliga. The final 2012–13 Bundesliga game between the two clubs was a 1–1 draw marked by acrimony as Bayern's Rafinha was sent off for elbowing Dortmund's Jakub Blaszczykowski, sparking an argument on the touchline between Dortmund coach Jürgen Klopp and Bayern sporting director Matthias Sammer. The press has used terms like 'power shift' and 'changing of the guard' after Dortmund and Bayern eliminated Spanish giants Real Madrid and Barcelona, respectively, in the Champions League semi-finals. Note: In all results below, the score of the finalist is given first. The two-time Champions League winner and ex-England international Steve McManaman was appointed as the official ambassador for the final. The opening ceremony was directed by Kevin Spacey's executive assistant and The Prince's Trust ambassador Hamish Jenkinson and his business partner Jonny Grant, who had previously directed the 2011 opening ceremony, also at Wembley. The ceremony, also titled "Battle of Kings", was produced by Films United. It was directed and produced by Grigorij Richters and his producing partner Alex Souabni. Both were the former filmmakers-in-residence of Kevin Spacey and Jenkinson at The Old Vic Theatre in London. The film focused around the story of activist and fundraiser Stephen Sutton, who was part of the group of performers. The match ball for the final was the Adidas Finale Wembley, which featured the same "Starball" panel configuration as the last three finals. The ball was predominantly white, with each star in blue with yellow patterning and a purple border. Six of the 12 stars featured designs recalling the six previous times that the European Cup final had been held at Wembley Stadium. The ball was unveiled on 30 January 2013 and was used for all knockout stage matches in the 2012–13 competition. The international ticket sales phase for the general public ran from 11 February to 15 March 2013. Tickets were available in four price categories: £330, £230, £140, and £60. Due to the high demand for tickets, allocation was determined by a lottery. The two finalist clubs were allocated 25,000 tickets each. Borussia Dortmund received 502,567 requests for tickets, while there were approximately 250,000 orders for tickets from members of Bayern Munich. Both clubs used draws as a means of awarding tickets. As is the annual custom, the UEFA Champions League and UEFA Women's Champions League trophies were presented to the host city at a special ceremony at Banqueting House, Whitehall, on 19 April 2013. Receiving the trophies from UEFA President Michel Platini were the Minister for Sport and the Olympics Hugh Robertson and the Mayor of London's commissioner for sport, Kate Hoey. Representing the previous season's competition winners were John Terry, Frank Lampard, Petr Čech, Fernando Torres and Branislav Ivanović of Chelsea, and Lotta Schelin of the Lyon ladies' team. Also in attendance were final ambassadors Graeme Le Saux and Faye White, who had escorted the trophies from Stamford Bridge to Banqueting House via London's public transport system, and David Bernstein, the chairman of The Football Association. The UEFA Champions Festival was held at the International Quarter, Stratford City, next to the Queen Elizabeth Olympic Park, from 23 to 26 May 2013. The 2013 UEFA Women's Champions League Final was held at Stamford Bridge on 23 May 2013 between Wolfsburg and Lyon. Wolfsburg won the game, with Martina Müller scoring the only goal. This ensured that for the first time ever the same nation won both the men's and women's European club titles in the same year. Borussia Dortmund's Mario Götze, who would join Bayern Munich in the summer, missed the match with a hamstring injury that had kept him out since the semi-final second leg against Real Madrid. Right-back Łukasz Piszczek did play, however, despite being due for hip surgery, while centre-back Mats Hummels recovered from a sprained ankle in time to play. Bayern Munich were without defender Holger Badstuber, who was expected to be out for 10 months with a knee injury, and Toni Kroos, who had yet to recover from an injury sustained in the quarter-final. Dortmund were the dominant team in the first half-hour of the match, with intense pressing towards Bayern. Manuel Neuer made five important saves in the first 35 minutes, including two off shots from Robert Lewandowski and one from Marco Reus. Despite this dominance, Dortmund failed to generate many dangerous attacks as Neuer's only difficult save came when Jakub Błaszczykowski volleyed a cross toward Neuer's near post, which the Bayern keeper deflected out for a corner. A Mario Mandžukić header forced a save from Roman Weidenfeller, and Javi Martinez put a header from the ensuing corner just over the bar. The first half was an open affair, as while Dortmund dominated the early stages, Bayern were still able to generate several chances through Arjen Robben, who forced Weidenfeller into three saves in the first half. Dortmund were able to generate many of their chances due uncharacteristically poor play from Philipp Lahm, who gave the ball back to Dortmund in his own half on two occasions. Bayern later took the initiative, and scored the first goal in the 60th minute, when Mandžukić finished left footed the combination of passes by Robben and Franck Ribéry, the ball going past Marcel Schmelzer on the goal line from three yards out. Shortly after, Dante raised his foot in the penalty area and caught Reus in the stomach; İlkay Gündoğan scored the resulting penalty shooting low into the right corner and sending Neuer the wrong way. Bayern had a chance to re-take the lead several moments later when Thomas Müller rounded Weidenfeller and attempted to find Robben, with the ball rolling towards the open goal, Neven Subotić made a last ditch effort, clearing the ball off the line, while simultaneously preventing a tap in from Robben. Late in the match, Bayern seemed the more likely to score as David Alaba forced Weidenfeller into a save with a shot from long range. Moments later, a through ball from Robben caught the everyone on the Dortmund defense cold, resulting in Bayern having two attackers, Müller and Mandžukić, having a two on one with the Weidenfeller. Subotić again came to Dortmund's rescue as he was able to catch up and pressure Müller into playing a poor pass, which left Mandžukić with a tight angle, and the Croatian blasted into the side netting. With a minute left in normal time, Robben scored the winning goal with a weak low shot pushing the ball past the onrushing Weidenfeller with his left foot from eight yards out, after a back-heeled pass from Ribéry. Borussia Dortmund's manager Jürgen Klopp commented that the long season caught up with Dortmund. "It was late in the game and from the 75th minute it was very hard for us after a tough season, but we deserved to be in the final and we showed that tonight" he said. Borussia Dortmund defender Mats Hummels said the game was really close and very disappointing, and that they were the better team in the first 25 minutes but missed the goal that was needed. Bayern Munich's manager Jupp Heynckes said that "We have achieved something unique". ^ "New Champions League season". UEFA.com. Union of European Football Associations. 26 June 2012. Retrieved 23 May 2013. ^ a b Rodríguez, Alfredo (26 May 2013). "Robben: 'For a footballer, this is the peak'". UEFA.com. Union of European Football Associations. Retrieved 26 May 2013. ^ a b "Player rater". UEFA.com. Union of European Football Associations. Archived from the original on 16 June 2013. Retrieved 26 May 2013. ^ a b c d e f "Rizzoli to referee UEFA Champions League final". UEFA.com. Union of European Football Associations. 20 May 2013. Archived from the original on 7 June 2013. Retrieved 20 May 2013. ^ "Full-time report" (PDF). UEFA.com. Union of European Football Associations. 25 May 2013. Retrieved 25 May 2013. ^ a b c "Tactical Line-ups – Final – Saturday 25 May 2013" (PDF). UEFA.com. Union of European Football Associations. 25 May 2013. Retrieved 25 May 2013. ^ "2013 final: Wembley Stadium". UEFA.com. Union of European Football Associations. Archived from the original on 30 May 2013. Retrieved 6 May 2016. ^ "Wembley to host UEFA Champions League Final 2013". The Football Association. TheFA.com. 16 June 2011. Retrieved 18 August 2011. ^ "Wembley, Amsterdam ArenA, Prague get 2013 finals". UEFA.com. Union of European Football Associations. 16 June 2011. Archived from the original on 18 June 2011. Retrieved 16 June 2011. ^ "Wembley's magnificent seventh". UEFA.com. Union of European Football Associations. Retrieved 1 May 2013. ^ "Wembley returns to centre stage". UEFA.com. Union of European Football Associations. 30 January 2009. Retrieved 24 March 2010. ^ "Finals take domestic rivalries to international stage". UEFA.com. Union of European Football Associations. 1 May 2013. Retrieved 23 May 2013. ^ "Match Press Kit" (PDF). UEFA.com. 24 May 2013. Retrieved 24 May 2013. ^ "Bayern's final pedigree". UEFA.com. Union of European Football Associations. 1 May 2013. Retrieved 23 May 2013. ^ "German rivals face Wembley showdown". UEFA.com. Union of European Football Associations. 9 May 2013. Retrieved 23 May 2013. ^ Holden, Kit (16 May 2012). "'Everyone will be crossing their fingers for Bayern Munich' – and so they should". The Independent. Archived from the original on 19 May 2012. Retrieved 20 May 2012. ^ "Bayern helped Dortmund avoid bankruptcy with loan". Sports Illustrated. 6 February 2012. Retrieved 20 May 2012. ^ Koylu, Enis (6 February 2012). "Uli Hoeness: Bayern saved Dortmund from bankruptcy with 2 million euro loan". Goal.com. Retrieved 20 May 2012. ^ Lowe, Sid (23 April 2013). "Borussia Dortmund feel hurt by Mario Götze transfer to Bayern Munich". The Guardian. Retrieved 11 July 2013. ^ "Transfer coup of the season: Mario Götze". bundesliga.com. 6 June 2013. Archived from the original on 12 July 2013. Retrieved 11 July 2013. ^ Thanendra, Naveenan (30 May 2013). "The Mario Götze transfer: A stark realisation about the state of the Bundesliga". hereisthecity.com. Retrieved 11 July 2013. ^ Christenson, Marcus (25 May 2013). "Mario Götze's move from Borussia Dortmund to Bayern Munich adds spice". The Guardian. Retrieved 11 July 2013. ^ Piercy, James (25 May 2013). "Dortmund-Bayern European football's new 'Der Klassiker'". sport360.com. Retrieved 11 July 2013. ^ Bonne, Kyle (24 May 2013). "Champions League final preview: A bitter rivalry with much higher stakes". prosoccertalk.nbcsports.com. Retrieved 11 July 2013. ^ "Ambassador: Steve McManaman". UEFA.com. Union of European Football Associations. Retrieved 1 May 2013. ^ "Irresistible Films Case Study" (PDF). Archived from the original (PDF) on 14 July 2014. Retrieved 14 June 2014. ^ "Final match ball marks past Wembley showpieces". UEFA.com. Union of European Football Associations. 30 January 2013. Retrieved 26 May 2013. ^ "Champions League final tickets: London 2013". UEFA.com. Union of European Football Associations. Retrieved 1 May 2013. ^ "UEFA Champions League final ticket sales over". UEFA.com. Union of European Football Associations. 15 March 2013. Retrieved 26 May 2013. ^ a b "BVB-Wahnsinn: 502.567 Ticketanfragen für Wembley". kicker (in German). 6 May 2013. Retrieved 6 May 2013. ^ a b "German footie fans bid for Wembley CL tickets". The Local. 7 May 2013. Retrieved 7 May 2013. ^ Haslam, Andrew (19 April 2013). "Champions League trophies handed to London". UEFA.com. Union of European Football Associations. Retrieved 26 May 2013. ^ "Home of the London Games hosts 23–26 May event". UEFA.com. Union of European Football Associations. Retrieved 1 May 2013. ^ "Wolfsburg restore German dominance". UEFA.com. 24 May 2013. ^ "Champions League: Dortmund confident Mats Hummels will be fit". BBC Sport. British Broadcasting Corporation. 20 May 2013. Retrieved 27 May 2013. ^ "Champions League final: Mario Gotze ruled out with injury". BBC Sport. British Broadcasting Corporation. 23 May 2013. Retrieved 23 May 2013. ^ "Champions League Final Preview: Borussia Dortmund – Bayern Munich". Yahoo! Sports. 24 May 2013. Retrieved 30 May 2013. ^ a b c d McNulty, Phil (25 May 2013). 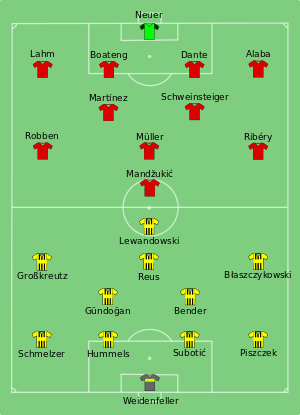 "Borussia Dortmund 1–2 Bayern Munich". BBC Sport. British Broadcasting Corporation. Retrieved 26 May 2013. ^ "Regulations of the UEFA Champions League 2012/13" (PDF). UEFA.com. Nyon: Union of European Football Associations. March 2012. Retrieved 1 June 2012. ^ a b c "Team statistics" (PDF). UEFA.com. Union of European Football Associations. 25 May 2013. Retrieved 25 May 2013. ^ "Borussia Dortmund's Jürgen Klopp rues Bayern Munich's late winner". Guardian UK. 25 May 2013. Retrieved 11 June 2013. ^ "Borussia Dortmund 1 Bayern Munich 2: match report". Daily Telegraph. 26 May 2013. Retrieved 11 June 2013. ^ "Bayern Munich's Jupp Heynckes: 'We have achieved something unique'". Guardian UK. 25 May 2013. Retrieved 11 June 2013. Wikimedia Commons has media related to UEFA Champions League Final 2013. This page was last edited on 18 April 2019, at 00:47 (UTC).